July 2 (FT) Mongolia will "in the very near future" end an impasse over investment in a $5bn coal mine and push forward "Steppe Road" infrastructure plans with Russia and China, the prime minister has said as he seeks to shore up investor support for his country's flagging economy. Saikhanbileg Chimed also indicated that Mongolia planned to launch another sovereign bond as the country seeks to get "back to business" following two years of slowing growth in gross domestic product, plummeting foreign direct investment and rating agency downgrades of its junk-rated "Chinggis" bonds. Official approval for investors to start work on the Tavan Tolgoi (TT) coking coal mine in the Gobi desert should follow soon after a review of the investor agreement in parliament this month, Mr Saikhanbileg told the Financial Times in an interview. Investors in the project include China's Shenhua Energy and Japan's Sumitomo Corp.
"TT will be unlocked in the very near future," he said. Several members of Mongolia's parliament have raised objections to financial and legal aspects of the TT investor agreement, raising the possibility that the mine — which has estimated reserves of 6bn tonnes — could suffer a similar fate to that of Oyu Tolgoi, a $5bn copper mine, where an expansion project was unblocked in May only after two years of wrangling. Lack of progress by Rio Tinto, the owner and operator of Oyu Tolgoi, in reaching an accord with Ulan Bator on the expansion highlighted investor concerns about the level of political backing for investment. This year, Mongolia resorted to a mobile phone referendum to shore up public support for the project. But Mr Saikhanbileg said there would be "no need" to deploy the same tactic to get the TT project under way. "I am confident [it will be approved]," he said. A 220km rail line from the mine into China, and a potential 1,300km rail line eastward to markets in Japan and the US, are also planned, Mr Saikhanbileg said. The prime minister, who took power last November with a mandate to put Mongolia's economic house in order, said the government was seeking to build a "very friendly business environment" by giving foreign companies the same regulatory treatment as local counterparts and freezing a 10 per cent corporate tax rate for up to 22.5 years for large inward investors. His aim is to reverse a drop in foreign direct investment inflows, which fell to $0.85bn last year, down from $2.29bn in 2013 and $4.4bn in 2012. The decline has helped depress Mongolia's foreign exchange reserves to $1.2bn, raising concerns it may have insufficient funds to repay $1.08bn in sovereign bonds that come due in January 2018. However, Mr Saikhanbileg did not see a swift rebound in FDI inflows to 2012 levels, saying that this year would remain "very challenging". He was hopeful that tax stability and the mining measures would see FDI bounce back. Asked about plans to issue another Chinggis bond, Mr Saikhanbileg said he could not talk about the details for legal reasons. "We will announce it when the time comes," he added. Improved relations with China following the visit last year of Xi Jinping, the Chinese president, figure strongly in Ulan Bator's strategy to attract investment and avoid a potential default on its international bonds. A proposed $50bn "Steppe Road" project to build a 997km highway and a 1,100km electrified railway connecting China and Russia through Mongolia would receive a boost this month when leaders of China, Russia and Mongolia met at the Shanghai Co-operation Organisation summit in Ufa, Russia, Mr Saikhanbileg said. Mongolia was open to financing from the China Development Bank, the China Ex-Im Bank and the China-led Asia Infrastructure Investment Bank as it implemented plans to strengthen infrastructure, he added. LONDON, July 1 (Reuters) - Mongolia's prime minister sees signs of progress in developing the country's biggest coal mine and a gold project, hoping to win back much needed foreign investment after resolving a dispute with miner Rio Tinto. Mongolia gets almost 90 percent of its revenue from the mining sector and was hit by a fall in commodity prices last year. An impasse with global miner Rio Tinto over underground development of the giant Oyu Tolgoi copper mine also tarnished its image as an investment destination. It contributed to an 87 percent decline in direct foreign investment last year which left the country struggling to stabilise its balance of payments. After reaching an agreement with Rio to resume work on the stalled $5 billion Oyu Tolgoi development in May, the government wants to push ahead with two more projects -- the big Tavan Tolgoi coking coal mine and the Gatsuurt gold mine. "After unlocking Oyu Tolgoi and also solving the Tavan Tolgoi project this is giving good signals to the investment community," Prime Minister Chimed Saikhanbileg said in an interview on Wednesday, adding he was targeting a growth in foreign direct investment to $4.5 billion a year in around 2-3 years. His cabinet was close to an agreement with a consortium of foreign companies to invest $4 billion in the 1.8 billion tonne coal mine before parliament halted the deal in April, saying it may breach Mongolian law. But on Wednesday Saikhanbileg said he was "quite confident" that his latest proposal would be approved by parliament next week. "After that, the government will be able to finalise negotiations with investors and move on," he said. The prime minister also said he would soon find an agreement with Canadian miner Centerra over the royalty regime that will apply to the Gatsuurt gold mine it owns. Parliament has indicated the country should not keep an equity stake in the project but should instead raise the mining royalty, he said. This would more directly benefit the country helping it relieve debt pressures. Saikhanbileg also indicated he was intending to abide by international arbitration which ordered Mongolia to pay more than $100 million to Canadian uranium explorer Khan Resources Inc in a licensing dispute. In an April statement the justice minister said the Mongolian government would "work for the invalidation of the arbitration award." "When an arbitration court makes its final call everybody should comply," he said. "Is there any other option?" July 1 (Industrial Minerals) Mongolia's incumbent Prime Minister has made his first visit to London to court foreign capital for new projects and appeal for investment to develop Mongolia's mining industry and commercialise strategic deposits. Mongolia's Prime Minister Chimed Saikhanbileg has today urged Western investors to invest in the country, as the government embarks on a strategy to grow its economy and strengthen its mining sector. June 30 (Bloomberg) -- Debt-laden Mongolian coal miner SouthGobi Resources Ltd. will raise about $32 million selling new shares to two investors and use the funds to repay dues. CITIC Merchant Co. will buy 50 million shares for $28.7 million, representing 17 percent of SouthGobi's shares outstanding, SouthGobi said in a statement Tuesday. Swiss Life Gestion Privee will pay $2.9 million for a 2 percent stake. The shares, listed both in Toronto and Hong Kong, were priced at 71 Canadian cents a share, a discount of 20 percent to the five-day volume weighted-average price on the Toronto Stock Exchange as of June 19. Hong Kong-listed SouthGobi, which mines coal in the mineral-rich Gobi Desert, has struggled to keep afloat and pay its debt amid low coal prices and legal cases with the Mongolian government. The company had warned of possible insolvency in May. The sale, to be completed on or before July 14, is part of SouthGobi's wider funding plan to repay an existing debt to China Investment Corporation. This includes a $7.9 million interest payment due on July 22. Failure to pay the amount could result in a default, SouthGobi said on May 20. Proceeds from the share sale will be used to meet debt obligations and working capital, according to Tuesday's statement. CITIC Merchant, an arm of the CITIC Group, will be allowed to nominate one director to the board as long as it maintains a share of 10 percent or more in SouthGobi. The stock fell 26 percent to 60 Canadian cents at the close on Monday in Toronto. The Hong Kong-traded shares fell as much as 7.3 percent to HK$4.80 and traded at $4.85 as of 11:04 a.m. local time. JOHANNESBURG, Julyy 2 (miningweekly.com) – Dual-listed SouthGobi Resources' former president and CEO Alexander Molyneux served the Mongolia-focused metallurgical and thermal coal miner with a notice of civil claim, filed in the British Columbia Supreme Court, it said on Thursday. The claim related to alleged breaches of Molyneux's employment agreement by the company. In addition to the company, Turquoise Hill Resources, SouthGobi's largest shareholder at the time of Molyneux's employment, was also named in the claim. Molyneux acted as the company's president, from April 2009, and CEO, from October 2009, until September 2012, when the company terminated his employment. This was a week after Aluminium Corp of China dropped a $926-million bid for the company that strained its relationship with the Mongolian government. SouthGobi, which was listed in Toronto and Hong Kong, did not give any reason for the termination of Molyneux's services. He was seeking damages in excess of $1-million, which the company considered to be without merit. "[We] intend to vigorously defend the action and reserve [our] right to pursue all legal rights and remedies available to [us] in connection with the proceedings," SouthGobi said in a statement. The company was currently focused on exploration and development of its metallurgical and thermal coal deposits in Mongolia's South Gobi region. It had a 100% shareholding in SouthGobi Sands, a Mongolian registered company that held the mining and exploration licences in Mongolia and operated the ﬂagship Ovoot Tolgoi coal mine. Ovoot Tolgoi produced and sold coal to customers in China. VANCOUVER, BRITISH COLUMBIA--(Marketwired - June 29, 2015) - Entrée Gold Inc. (TSX:ETG)(NYSE MKT:EGI)(FRANKFURT:EKA) ("Entrée" or the "Company") provides the results of the Company's Annual General Meeting ("AGM") held on June 29, 2015. July 2 (MINING.com) Foreign investors, whose dollars make up a big component of Mongolia's $11.7 billion economy, have been recently put off by a combination of falling commodities prices and the hectic views of the its policy makers. Expansion of Rio Tinto's Oyu Tolgoi mine — which was under review for over two years — is a clear example of the rollercoaster some miners must ride if they choose to do business in Mongolia. Then, there is the case of Canada's Khan Resources (TSX:KRI), whose license for the Dornod uranium deposit it was developing was expropriated in 2010, and given to Russian producer ARMZ. The Toronto-based company is still waiting to get a $104 million arbitration payment awarded by an international court in March. However, ever since Rio and the country's government reached an agreement in May, things are looking up. "To see Oyu Tolgoi finally moving forward is nothing but good news for smaller companies operating in Mongolia," Erdene Resource's (TSX:ERD) vice president and CFO Ken MacDonald said in a recent presentation at the 128th Annual Meeting of The Nova Scotia Mining Society. For the Halifax-based company the road hasn't presented too many bumps. For about three years the firm has been developing its wholly owned Altan Nar gold-polymetallic project in the Tien Shan Gold Belt of southwest Mongolia, discovered in late 2011. "It is difficult to understate the importance of Oyu Tolgoi in determining Mongolia's long-term economic fortunes," said BMI Research. "The development […] suggests that the government is likely to adopt a more benevolent stance towards foreign mining investment over the coming years, following a significant drop-off in foreign direct investment over 2013 and 2014." Erdene's executive didn't seem too surprised about the agreement. He said he sees such move as being consistent with the promises of 47- year-old Prime Minister Saikhanbileg Chimed. After taking office in November, he vowed to put an end to several high profile disputes with overseas companies in order to regain investors' confidence, MacDonald said. "We believe the discovery at Altan Nar, with its high-grade zones, size potential and location, provides an opportunity with the flexibility to move rapidly towards a small-scale start-up and ultimately towards a very large gold, silver, zinc and lead development on the border with China," MacDonald noted. With an initial NI 43-101 compliant mineral resource established, the company's current work plan at Altan Nar includes process test work, as well as evaluations of the mining, engineering, transportation, and marketing options. This work is expected to consider options for expedited development including evaluating the concept of producing a potentially high value gold, silver, lead and zinc concentrate to be sold into China, and transported via rail to the south of Altan Nar for final processing. Mongolia's mineral wealth attracted several firms in the past two decades as it opened up to investment. The main attraction has always been the country's riches — vast deposits of copper, coal and iron ore— as well as its proximity to China, the world's biggest buyer of the minerals. The enthusiasm peaked in 2011 when land-locked Mongolia's economy grew 17% or the fastest pace on the planet. It's been downhill since. July 1 (Nasdaq) Mongolia is known as the land of eternal blue sky because it has about 250 sunny days a year. In a recent conversation I had with my friend, Gary Kucher of Mongolia Holdings, who does a lot of investing in Mongolia, I asked him how cold it gets there in the winter. "Very cold," he replied, and then expanded, "So cold that if you accidentally spill your hot coffee outside during the dead of winter, if freezes before it hits the ground." "And the lure of Mongolia is?" I asked him in response. "It's truly the final frontier," he replied. Recently Mongolia has been getting a lot of positive press. They appear to be finally putting their previously housed socialist beliefs behind them and embracing capitalism as a whole. Prime Minister Chimed Saikhanbileg recently visited the United States and had high-level discussions with people in the US government and the United Nations. In fact, Senator John McCain sponsored a resolution to congratulate Mongolia on 25 years of democracy. In addition, the Prime Minister visited the New York Stock Exchange and had several discussions with industry leaders with an eye on encouraging biotechnology and pharmaceutical manufacturing in Mongolia. All in all, his visit was extremely successful. Why all of a sudden is Mongolia being offered this level of access? Simply put, it's because of geography and commodities. A short history of Mongolia is now in order. It was in the 13th century when the fiercest and most well-known Mongolian of them all, Genghis Khan (1162-1227), together with his army conquered much of Asia, some of Europe and went as far south as India. To this day, he is highly revered and there are several monuments to him throughout the country, although his actual burial place is unknown. The Cyrillic alphabet has been in wide use since the 1940's, but the traditional Mongolian script that has become a compulsory subject in primary and secondary schools, and is slowly gaining popularity, was adapted by Genghis Khan from the Uyghur. And even though he is best known for his military exploits, he was a great uniter and a very tolerant ruler. Now back to modern day Mongolia and my friend Gary. Both Gary and Jeffrey Leach, the chief operating officer of Mongolia Holdings, tell me that the reasons to invest in that country are its vast untapped resources and a population that is extremely capitalist minded. Although not a large population, approximately 3 million, of which the capital Ulaanbaatar has about 1.3 million. Much of the remainder of the country is breathtakingly beautiful and diverse, with the Gobi desert in the south and forests lakes and rivers in the north. Mongolia does have a stock market that was developed together with the London Stock Exchange, but its capitalization is the smallest in the world at about 1 billion dollars, with around 237 listed companies. Unfortunately, due to an economic slowdown due to a decline in international commodity prices over the last few years, the amount of publicly listed companies has declined from a high of around 336 in 2010. Hopefully, this situation will be remedied very soon by a recent business outreach program recently initiated by the Mongolia Stock Exchange ("MSE"). In addition, a well-publicized but recently resolved dispute between the government and Rio Tinto, over phase 2 of the mega gold/copper mine Oyu Tolgoi, may have also had some dampening effect on the economy and foreign direct investment. However, since the recent amicable resolution, Mongolia's benchmark stock index has risen in the longest winning streak since 2009, according to Bloomberg. The Bloomberg article quotes from an email written by Nick Cousyn, chief operating officer of BDSec, Mongolia's largest brokerage, on June 16, 2015: "We are seeing aggressive buying from local and foreign investors alike. Successful resolution of the Oyu Tolgoi underground mine plan caused a bottoming-out of MSE-listed stocks." Another major western company involved in Mongolia is Hertz Equipment Rental (doing business under the name Mongolia Holdings "MNHD", its franchisee there). Considering that infrastructure is a huge priority of the government and vast sums of money are being laid out, this company may be worth watching. In addition, a local public company is APU, which was a joint venture with the government but its stock has been fully tradable on the exchange since 2001. APU owns Mongolia's largest brewery and operates a chain of restaurants called Ikh Mongol. Finally, one of Prime Minister Saikhanbileg's stops in the United States was at the offices of the investment bank J.P. Morgan. J.P. Morgan has been active in providing funding for projects in Mongolia and has expressed an interest in providing funds for infrastructure projects; however, rumor has it that they may be launching a joint investment fund, which was authorized by the cabinet in Mongolia last December. Interest in investing in this final frontier is on the rise and is really just beginning. The geographic location and the fact that it is a parliamentary democracy make it a very attractive destination for both foreign institutions and retail investments. I am sure that as the development of the country expands, there will be numerous investment opportunities, and even an ETF or mutual fund launched with Mongolia as a focus. Just a word of caution, unless you really like the cold, visit the country in the summer. Ulaanbaatar, July 2 /MONTSAME/ At the Stock Exchange trades on Wednesday, a total of 502 thousand 819 units of 14 JSCs were traded costing 83 million 602 thousand and 909.50 Togrog. "E-trans logistics" /490 thousand and 494 units/, "Genco Tour Bureau" /10 thousand and 61 units/, "Merex" /580 units/, "State Department Store" /500 units/ and "Suu" /243 units/ were the most actively traded in terms of trading volume, in terms of trading value were "E-Trans Logistics" (MNT 53 million 463 thousand and 846), "Suu" (MNT 26 million 258 thousand and 100), "Genco Tour Bureau" (MNT 980 thousand and 918), "Gobi" (MNT 924 thousand), and "APU" (MNT 815 thousand and 52). The total market capitalization was set at MNT one trillion 391 billion 454 million 40 thousand and 308. The Index of Top-20 JSCs was 14,714.57, increasing 0.16% and the all index of MSE was 1,013.68, increasing 0.18% against the previous day. June 30 (Mongolian Economy) Since signing a Memorandum of Understanding with the government, Mongolbank has printed approximately 3.5 trillion MNT in three years, and injected the money into the economy through commercial banks under many different programs. This amount of money, which equals 75 percent of Mongolia's budget revenue, has gone to the banks with an interest rate almost three times lower than the market rates. Having calculated their costs and profits after receiving the money, the commercial banks have increased the interest rate by 3-4 percent when lending to clients. In this fashion, only a few commercial banks keep receiving billions of tugriks with an interest rate of 5-6 percent under the programs for price stabilization and housing loans. However, they are getting the money with no specific terms or any restrictions such as a requirement to return the money if they are not able to lend it out. It appears that the banks have significantly cut their lending to people since 2014. By the end of 2014, approximately 100 companies acquired loans under the 'Export promotion and export substitution 888' project. Some companies are still not able to get the loan despite participating in the project and having all required documentation ready. As a last resort, those companies established an NGO named 'The Group of 777' and held a press conference to demand the government not to show discrimination. WHO PROFITS FROM GOVERNMENT BONDS GOING THROUGH BANKS? Simultaneously with the price stabilisation program, the government started issuing a large amount of short term bonds. In other words, the government started covering its operation costs using loans. The government issued bonds worth 2.5 trillion MNT and 2.6 trillion MNT in the fiscal years of 2013 and 2014 respectively. This year they will issue bonds worth 3.4 trillion MNT, 2.1 trillion of which is already out in bonds. It catches one's attention that the large amount of bonds has been purchased by a small number of commercial banks only. Only four or five commercial banks are artificially increasing the interest rate of the government bonds, which becomes the basic price in economy. It is causing other interest rates to hike up. This is one of the reasons why the interest rates offered by commercial banks are very high and are not going down. The interest rate of government bonds was nine percent on average in June 2014. However, banks increased it to 16-18 percent within 3-4 months only. Nevertheless, these high interest rates are financed by the public budget, i.e. taxpayers' money. From here, one can see who profits from increasing the interest rate of government bonds through commercial banks and who pays to allow them to gain profit. It is agreeable to keep the private sector profitable. However, the people must know everything around the expenditure of public budget. Mongolbank does not disclose publically which commercial banks of Mongolia are acquiring those soft loans under what criteria. It is viewed by Mongolbank that such detailed information of private banks does not need to be made public. However, the people are not aware that the government bonds come from the public budget, which is made up by the taxes we pay. Suspicion arises when the commercial banks receive a cheap source from Mongolbank, purchase six month government bonds with an interest rate of 16 percent, and postpone lending the money to clients for unidentified reasons to make a profit of ten percent. Mongolia currently does not have a mechanism of independent audit that could verify this hypothesis and investigate how private banks are handling public funds. The reason that we lack such a system, is because the owners of almost all banks eventually become members of parliament who make the laws, is it not? In contrast to almost all industries struck by economic decline, who are caught in debts and seeing their biggest companies unable to pay employee salaries on time, the commercial banks have thrived. Those banks made a profit of 330 billion MNT in 2014. It shows how privileged this sector is. The private sector should obviously be profitable. Nevertheless, the people must know everything when it comes to the expenditure of the public budget. Those private companies that barely managed to acquire a loan with an annual interest rate of 24 percent and are struggling to pay the monthly rate of two percent want to know more about it. WHO PROFITS IF GOVERNMENT BONDS GO THROUGH STOCK EXCHANGE? As previously stated, government bonds (tugrik loans) go through Mongolbank only, and are purchased by a small number of commercial banks. Private companies and individuals are not able to buy them. However, by the end of 2014, there was a decision to have the government bonds placed on the stock exchange, which stopped commercial banks from acting as brokers. However, it did not take long before a new chairman of the financial regulatory commission reinstated the previous process. As the commercial banks retrieve their monopoly, they are still making all transactions. During a few months when the government bonds went through the stock exchange, approximately 150 domestic and foreign investors were newly registered in the capital market and purchased bonds worth 80 billion MNT. The senior management of the stock exchange claims that an additional 60 billion MNT of bonds is currently in demand. When the trade of government bonds was regulated by the market for the first time in history, the secondary market started functioning. It made the interest rate of government bonds go down, which has positive impacts on budget expenditure. On the other hand, it allowed the 700 billion MNT reflected in the 2015 public budget as payment of government bonds to be allocated to thousands of individuals and companies, instead of owners of a few banks. It means that the government bonds, which are most guaranteed to be repaid when they are on the stock exchange, could be bought with money from the social insurance fund paid by you and me, and placed in an account in a commercial bank with ten percent rate only. The only way to keep the public funds under public scrutiny, rather than private control, is the capital market. It is currently impossible to know how much the decision makers are being rewarded for putting public funds into commercial banks. On the contrary, if it was on the stock exchange, there would not be any room for corruption as buyers and sellers do not meet face-to-face. Another example of how the lawmakers are stealing from public funds has recently been revealed on the internet (http://www.mass.mn/n/36105). It appears that some members of parliament acquired loans from the Development Bank claiming that they would implement various projects using the names of the companies that were included in their income statements. M.Enkhbold received a loan of ten million MNT whereas M.Garamgaibaatar 30 million, S.Byambatsogt 23 million, L.Enkh-Amgalan 34 million, J,Enkhbayar 14 billion, Su.Batbold 500 million, and N.Nomtoibayar 55 million. Is this true? Isn't it the time to restrain members of parliament from taking money out of public funds? Speaker Enkhbold, did they become a member of parliament to steal from public funds? If they want to have a piece of public funds, they can turn their private companies into public shareholding companies. Public funds must be on the stock exchange regulated by the market principles. The stock exchange is a financial market where it is easy to have public scrutiny, set prices in a fair way, and restrain corruption. 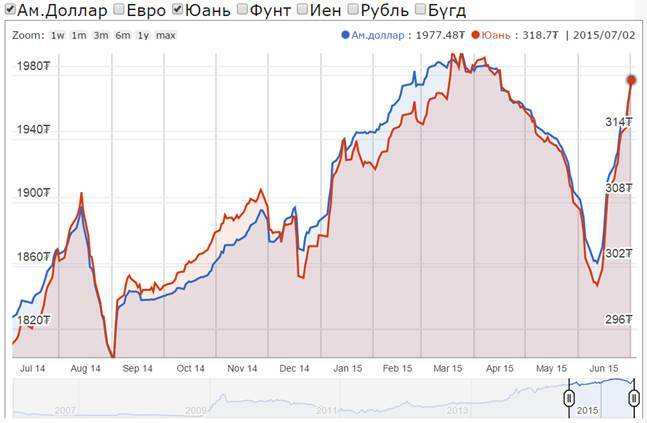 July 1 (Bloomberg) -- FX reserves fall 0.84% y/y, down 3.57% YTD, according to data on the Bank of Mongolia website. June 30 (Bank of Mongolia) On the Foreign Exchange Auction held on June 30th, 2015 the BOM has received bid offers of USD and CNY. The BOM has sold USD 14.0 million in a rate with MNT 1967.00 and CNY 86.0 million in a rate with MNT 315.50. On June 30th, 2015, The BOM has received MNT Swap agreement bid offer equivalent to USD 40.3 million and USD Swap agreement bid offer equivalent to USD 20.0 million from local commercial banks and the BOM has accepted the offers. 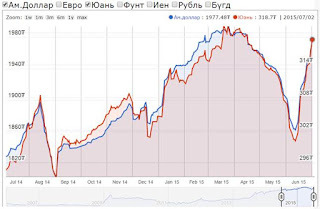 July 2 (Bank of Mongolia) On the Foreign Exchange Auction held on July 2nd, 2015 the BOM has received bid offers of USD 31.6 million in a rate between MNT 1969.51-1980.00 and CNY 125.0 million in a rate between MNT 317.55-319.00 from local commercial banks. The BOM has sold USD 23.0 million in a rate with MNT 1975.00 and CNY 62.0 million in a rate with MNT 318.01. On June 2nd, 2015, The BOM has received MNT Swap agreement bid offer equivalent to USD 89.5 million and USD Swap agreement bid offer equivalent to USD 4.5 million from local commercial banks and the BOM has accepted the offers. June 30 (Bloomberg) -- Mongolia experienced a net outflow of $40.9m in foreign direct investment in Jan.-May compared with $344.6m gain in same period yr ago, according to preliminary data released by the central bank on Tuesday. July 1 (BoM) Auction for 28 weeks maturity Government Treasury bill was announced at face value of 15.0 billion MNT. Face value of 15.0 billion /out of 22.5 billion bid/ Government Treasury bill was sold at discounted price and with weighted average yield of 14.885%. July 1 (BoM) Auction for 3 years maturity Government Bond was announced at face value of 10 billion MNT and each unit was worth 1 million MNT. Although 30 billion MNT in competitive bid was received, the Government bond was not sold due to the decision made by the MoF. ULAANBAATAR, June 29, 2015—Mongolia's economy remains under pressure but prospects have improved after the agreement on the second phase development of the Oyu Tolgoi mine, according to the World Bank's Mongolia Monthly Economic Brief. "An important step was taken to revitalize foreign investment inflows by the recent agreement on the second phase development of the Oyu Tolgoi mine," said World Bank Senior Economist Taehyun Lee. "This will help ease the balance of payments pressure in the short-term and support Mongolia's growth potential in the longer term." The monthly report called for a supplemental budget to help the government address large revenue shortfalls, which reached 18 percent in the first five months of 2015. Declining imports, weaker copper and oil prices and sluggish growth, as well as overoptimistic revenue projections, all contributed to the revenue shortfalls. "Consolidating and managing the budget deficit will help address the underlying causes of the current economic difficulties," said James Anderson, World Bank Country Manager for Mongolia. "A supplementary budget would enable the budgetary authorities to properly prioritize spending consistent with realistic revenue estimates and the Fiscal Stability Law. At the same time," he continued, "care must be taken to prioritize spending in a way that does not adversely affect the most vulnerable of the population." Plenary session is scheduled for today. July 1 (Mongolia Focus) I have written about corruption in various contexts in the past, most recently comparing the context of anti-corruption movements in India and Mongolia. In that post, I wrote that, "Petty corruption, systemic corruption, as well as grand corruption appear to be wide-spread if not endemic in Mongolia." "Wide-spread if not endemic" is the phrase I have used generally to refer to corruption. Yet, concrete information is obviously preferable to such a vague generalization. This is where I was delighted to see the publication of the Asia Foundation's most recent (2015) "Annual Survey on Perceptions and Knowledge of Corruption (SPEAK)". The Asia Foundation has been engaged in Mongolia since the early days of democracy and has built up multiple programs and strong expertise. The SPEAK survey itself builds on the Mongolia Corruption Benchmarking Survey that was conducted annually from 2006 to 2011. Since 2012 it has been known as SPEAK. If you look at the report, you will find a detailed methodology section that focuses on a "multi-stage, random sampling procedure … with probability sampling in an area cluster. " (p. 9). Essentially what this means is that more and more specific geographic areas are selected at random to ultimately give interviewers a starting point for face-to-face surveys from where they proceed by a further random rule. Ultimately this yielded over 1,360 sampled households, 560 in Ulaanbaatar and 800 in the countryside. The fact that this is an annual survey gives me even more confidence in it as it allows to compare longer trends that are impacted less by daily news and other swings in political mood. Of course, there are lots of sources of error in this kind of methodology, though hopefully not of systematic error. It is worth noting that this is a survey of perception of corruption, not of corruption itself, as is true of most instruments that deal with corruption though there have been promising attempts at measuring actual experience of corruption with experimental methods. To me, the most pressing questions about the perception of corruption are: 1. how widespread is it?, 2. is corruption improving or deteriorating? Ultimately the answers to these questions can inform and lead to a discussion of how corruption can be addressed best. Since the beginning of these surveys in 2006, over 80% of the respondents have agree (agree or somewhat agree) with the view that "corruption is a common practice in Mongolia" (Figure 1.4, p. 12). Somewhat oddly, the number of respondents who reply "don't know" or decline to answer has gone up over the years from a low of 1,4% in 2006 to 6.4% in 2014 (4.7% this year). For 2015, 64.6% agree with "common practice" and 20.7% somewhat agree for a total of 85.3%. To me, that settles the question of whether corruption is endemic of not with an emphatic, "Yes!". Yet, the number of respondents who identify corruption as a major problem has held steady around 8%. Whereas corruption has been identified by the third-most number of respondents in the past, it has now been surpassed in mentions by "national economy". Unemployment, inflation and national economy are mentioned as the single major problem by 49.5% of respondents. "It's the economy, stupid!" Does the fact that most see corruption as a common practice, but that few people identify it as a major problem, an indication of resignation regarding anti-corruption efforts, or a lack of recognition of the losses related to corruption? Or does it follow from the SPEAK finding (p. 16) that respondents see corruption having an impact on their personal life only to "a small extent" and that this impact appears to be receding over time. Along the lines with the perception that the impact of corruption is greatest in politics, respondents have identified the following institutions/facets of political life as the most corrupt: 1. land utilization, 2. political parties, 3. mining, 4. national government, 5. parliament. This is a marked and worrisome change from previous surveys that had never led to a listing of the national government, nor of parliament among the top 5 of corruption. The fact that political parties were ranked the second-most corrupt also suggests that this is not a matter of the actions or perceptions of a single party (though the DP obviously has a majority in parliament and in cabinet), but of political parties more broadly. In the eyes of Mongolians, their main political actors are corrupt! For the country's sake, anyone ultimately is inspiring to be Scandinavian in the absence of corruption, but is Mongolia moving towards that goal? The longitudinal nature of the SPEAK data allows is to assess this to some extent. I already discussed the shift toward political parties, the government, and parliament in perception of worst institutions above. This shift seems to be paralleled by the general sense that things are getting worse in Mongolia over the past several years. The graph on p. 20 of the report (Figure 4.1) illustrates this nicely by charting responses to the question of how corruption has changed in the previous three years. The number of people who responded that corruption had increased a little or a lot was declining from 2010 until 2014 to a low of just under 40% and increased sharply in 2014-15 to just under 60%. Not a good trend line, particularly since respondents are also less optimistic about the fight against corruption in coming years. When it comes to families payment of bribes, however, the development is more positive. In fact, Figure 9.3 (p. 37) shows a decline in the number of respondents who acknowledge having paid a bribe in the past three months from 28% in 2006 to 7% in the most recent round of surveying. This is one question where SPEAK is not just about perceptions but aims to ask about behaviour. There are obvious challenges in interpreting this figure given some (presumed) tendency by respondents to underreport bribes, however, the overtime trend does suggests a decline, unless the awareness of bribing as unnecessary or immoral has risen massively and no other responses in the survey suggest that. As a four-time election observer and given the looming 2016 and 2017 elections, I'm obviously interest in perceptions of corruption in the context of voting (pp. 13-16). The survey asked respondents to identify their expectations of fairness and transparency of the election in five stages: preparation and registration, campaign finance, campaigns, vote counting, and reporting of results. Of these respondents have the greatest confidence in the fairness of the campaign with 45% expecting fairness to a moderate or large extent. By contrast, they have least confidence by far in campaign finance with a whopping 40.5% reporting no expectation of fairness at all, and an additional 17.3% expecting a small extent of fairness. Because SPEAK covers a variety of topics in addition to corruption, there are some interesting findings sprinkled throughout the report. For example, the listing of "Major Problems" (pp. 11-12). Surprisingly (to me), inflation got fewer mentions this year than in 2014, and much fewer than in 2013 (down to 10.9% from 21.5%). I find this surprising since inflation is often mentioned in conversations with Mongolians as the factor that makes the current economic turmoil most tangible in daily life next to employment concerns. But even concern about unemployment (the most frequently mentioned major problem) is roughly steady across the past three years. Given the ultimate aim of reducing corruption, the question arises of how achieving this aim might be expedited in some fashion. In my conversation with MAAPPS student Asim, I concluded that a popular movement has to proceed political action. All the questions in the SPEAK data about the IAAC (Independent Authority against Corruption – АВЛИГАТАЙ ТЭМЦЭХ ГАЗАР) suggest that expectations of this regulatory approach and of enforcement of already-existing laws and regulations are high. But, while such enforcement will punish offenders and thus offer some deterrence, it seems to me that it's a change in politicians' (and others' mindset) that's most needed. As the German proverb has it, "Der Fisch stinkt vom Kopf her" (i.e. a fish rots from the head), so its society's head that needs to be addressed. But, more avenues to bring concrete evidence of corruption to the public's view is needed. The media in Mongolia seems to be largely involved in finger-pointing and outlandish accusations, rather than concrete instances of corruption. This is certainly the case with electoral fraud and manipulation, but also extends to other areas. Transparency is only as good as the use that civil society and the media put information to. This is very clear in the case of the important Extractive Industry Transparency Initiative, for example, which has been making information about revenue streams transparent for some years. Legislation extending the EITI seems to be in parliamentary limbo at the moment, but the information that has been made available through the EITI has not been used enough by civil society and the media to have the desired effects. This is why some level of social mobilization appears to be required. I personally believe that such mobilization would also have to occur in the political realm, whether through established forces like the Civil Will Green Party or a generational change in either of the long-standing larger parties, or through new political movements (it's not at all clear whether this might be one of the aims of the new National Labour Party). June 30 (Bloomberg) -- Mongolia's first Holiday Inn will open in 2016, the state-run news agency Montsame reported on Tuesday. June 30 (gogo.mn) With this section on our website we are aiming to introduce the many possibilities and opportunities Mongolia can offer despite all the negative light shed lately through the international media. Today's guest of our Mongol Mind section is designer of Khariin Khurim Salon /Love Wedding Salon/ B.Uugantsetseg. Jointly with designer E.Tuul and artist D.Narantsetseg they have launched completely new collection in view of upcoming Naadam Festival. By completely new we mean the designs incorporating latest fashion trends with blend of traditional Mongolian garment details and printed silk with images of Great Mongolian Queens. How many years the salon is operating? It has been already 9 years since the Khairiin Khurim Salon opened its doors to our clients. It is our anniversary on June 28th. As of me I am working as a designer for 15 years since I have graduated in 2002. Why you named the salon as Khairiin Khurim /Love Wedding/? First we thought of doing good quality and nice wedding gowns, as there were not many places where brides could go back in 2006. It was almost impossible to find a place where brides could get what they really wanted and what they have been dreaming all their lives. So we decided to focus more on wedding gowns and we came up with the names like wedding, love and etc. Then we just put together Love and Wedding into Love Wedding. Have you ever counted how many brides you dressed up? I always get asked on this. There were so many of them so I just lost my count. We do so many garments, gowns and everyday clothes for everyone who approaches and chooses us. So it is now impossible to come up with the exact number. Among your clients you have many public figures and politicians how did you attracted them? Before opening this salon I have been working for the Goyol Salon, which was owned by a Korean owner and was one of the best ateliers in Mongolia back then. There I have spent 4-5 years learning from foreign designers and improving my skills and techniques. As that salon was the best in town many public figures and politicians were frequent clients. Unfortunately Goyol salon is not operating anymore. Then we, by we I mean E.Tuul and me, have decided to open up this salon together and that is how we 'inherited' our loyal customers. Every year during Naadam Festival works of Khairiin Khurim salon is on 'display' at the opening ceremony as many guests are wearing your collections, which again states how your loyal clients are always returning to you. What is the secret of keeping them coming back? Personally I am more focusing on the how the clothing is designed and crafted. Here we work closely on every piece of clothing with the client, on what is desired by the client, how one wishes it to be done and with what kind of texture. On our end we are advising with design and help with choice of the texture to be applied to that specific design. Afterwards, we pay huge attention on the craftsmanship of each and every piece that is being crafted in this salon. My principle is to serve the client with as much attention to detail as one should be served and make sure that the customer is satisfied with our job. And of course with years of what we have learned here, we are still improving our skills and techniques. The collection displayed here is made with very fine fabrics, which is hard to find in Mongolia. How did you solve this problem? That is the exact problem we designers face every day. Every designer would say that, because Mongolia is not a manufacturer of the textile, except cashmere, or even one button or zipper that goes into creation of the whole outfit. While the outfit is not only the fabric used it is also an incorporation of whole lot more details, while one could only see the fabric as the main constituent. Due to the shortage of textures and fabrics available in Mongolia designers are very limited with what they can create. For this specific collection we have researched for long for silk manufacturers in China, as the traditional fabrics used for crafting Deel is very tough and not suitable in summer for Naadam festivities. We have approached the oldest silk producer in China, which only specializes in fine silk. Silk used for the collection is 100 percent fine silk, which enabled our collections to be very light in texture and more comfortable to wear in summer. How about the idea of this collection? Why Mongolian Queens? Tuul and I were talking about creating Mongol costume inspired collection and the initial idea was to use silk with prints on it. In search for the picture to be printed on the material we visited art galleries and studios of artists. After long search we have agreed that our collection should have images of Great Mongolian Queens and nothing more will fit perfectly into the idea of the whole collection. In this regard, we contacted talented artist D.Narantsetseg specializes in depicting images of famous Mongolian queens. So after discussion we have chosen to use works 'Borte', 'Mandukhai', 'Esui' and 'Domog' /Legend/ from numerous of her works. So this collection is not only the sole creation of two designers, but an incorporation of fine arts by famous artist as well? Indeed, this is very unique collection, as we wanted to deviate from the traditional making of Deel, where it uses tough silk or up-right collar or even the Hunnu collar. There were some critics to say that the collection spoils the whole concept of the Deel. But we took different approach by making the Deel comfortable and chic, which will be suitable to wear as evening gown or in hot summer days during Naadam Festival. How much time did you dedicate to this collection from the time of idea conception and until the collection was ready to display? Initial idea of this collection was in talks since last year around this time. We worked on the idea first, and then searched for the art work to be printed on the silk, then it took time to research the silk manufacturers, contacting them and ordering the prints. With ordering the prints it took a while to figure out the sizes of the prints as we had in mind dresses and tops, so that the prints should have been of different sizes as well. After receiving the silk we also revised our designs and made necessary changes as well. Many might be wondering with the incorporation of the traditional Deel elements into modern silhouettes and latest trends of fashion. Which Deel parts you mostly incorporated in this collection? As the prints on the fabric suggest, we used main elements of the Queen's outfit, which are high shoulder elements and long sleeves. For sleeves, as it no longer serves its initial purpose we solved it to act as an additional accessory. Other parts of Deel can be seen in using the strips and stitching at shoulder and waist parts of our garments. As of the modern trend in fashion we applied ply to give a different feel to the texture of the silk as the one we chose was very light. So we ordered different sizes of ply depending on the length of the skirts and the design of a particular dress. Lately it has become a trend for Mongolian designers to use Mongolian garment elements into their collections, which are participating in international fashion shows? Is there an opportunity for Mongolian designers to come up with new fashion trend globally with use of our own traditional elements? Indeed we have rich resources to work with. Mongolian national garments have huge number of those details, which require handwork and unique techniques specific to only Mongolian clothes. In this regard, we have plenty of assets to work with. Some of our clients who study or work abroad will come and say that even a top with Mongolian clothing detail would look nice on jeans and will clearly state that the person is from Mongolia and that they want it the clothing to be comfortable and have lighter texture than of traditional Mongolian garments made with silk. So I would say there are plenty of resources and plenty of opportunities. How many time a year Khairiin Khurim conducts these kinds of events? This exhibition event is first of its kind for us. Previously we did our fashion shows at the salon to introduce new collections. Exhibition makes it possible for the public to enjoy the collection within their convenient time as we held it for four days. It also enables audience to feel the fabric, take a closer look and make their decisions whether to buy the garment or not. So it means this year you took completely different approach? Yes, different in forms, different in fabric and different in designs as well. How many people have worked behind this beautiful collection? Altogether there are about 13-15 people who have dedicated their time and effort to this collection. All our designers and tailors have been involved in the making of the collection and we employ around 10 contractors on top of our 10 main employees as of today. Do you ever take one gown or dress from each of the collections that you really liked or feel attached to? Mostly our collections always get sold out. And, honestly saying, I have never thought of keeping one design for my own. We have the pictures and sketches of our collections, but of course the end product and the sketch have so many differences and the final products is always a pleasure to look at. But that is a good idea to keep in mind. June 30 (infomongolia.com) Prime Minister Ch.Saikhanbileg is paying a working visit to the United Kingdom of Great Britain and Northern Ireland on June 30 - July 3, 2015. On July 1, PM Ch.Saikhanbileg will open trading at London Stock Exchange and attend Investors Business Forum, and deliver a speech at the meeting of the Board of Directors of European Bank for Reconstruction and Development (EBRD). Later, Ch.Saikhanbileg will have talks with Minister of State for Trade and Investment Francis Maude, Secretary of State for Foreign and Commonwealth Affairs Philip Hammond and Minister of State for Foreign and Commonwealth Affairs Hugo Swire. Also, Prime Minister will give an interview to CNBC, Bloomberg Asia, Financial Times, Reuters and BBC radio. June 30 (infomongolia.com) Myanmar President U Thein Sein has paid a state visit to Mongolia at invitation of President Ts.Elbegdorj on June 28-30, 2015. On June 30, Myanmar President U Thein Sein has left Mongolia after concluding his state visit and Minister of Foreign Affairs L.Purevsuren, Director of the Department of Asia, Middle East and Africa of Foreign Affairs N.Naranbat, Ambassador Extraordinary and Plenipotentiary of Mongolia to the Republic of the Union of Myanmar Ch.Battumur, Ambassador Extraordinary and Plenipotentiary of the Republic of Union of Myanmar to Mongolia U Thit Linn Ohn were present at the airport to say goodbye to President U Thein Sein. During his state visit, President U Thein Sein had one-on-one meeting with President Ts.Elbegdorj. Later, the heads of state had extended negotiation and exchanged views on possible bilateral cooperation on trade, mining, tourism, culture and economy. Mongolia and the Republic of Union of Myanmar have signed the intergovernmental agreement on tourism cooperation. Ulaanbaatar City Council and Naypyidaw Council, Mongolian National Chamber of Commerce and Industry and the Union of Myanmar Federation of Chambers of Commerce and Industry have signed Memorandum of Understanding on Cooperation respectively. The state visit of President of the Republic of Union of Myanmar is a historical event as President U Thein Sein is the first ever president of Myanmar to pay a state visit to Mongolian since the establishment of diplomatic relations between Mongolia and Myanmar in 1956. At the end of the state visit, presidents of Myanmar and Mongolia have made a joint statement. Prime Minister Ch.Saikhanbileg and the Speaker of Parliament Z.Enkhbold have paid a visit to President U Thein Sein during his state visit. July 2 (VNA) Vice Speaker of the Mongolian Parliament M.Enkhbold has expressed his desire to develop ties with Vietnam across economics, trade, investment, national defence, security and at multilateral forums in the region and the world. At his talks with visiting Vice Chairman of National Assembly Huynh Ngoc Son on July 1, M. Enkhbold suggested the two legislatures help with preparations for the 16th meeting of the Inter-Governmental Committee this year in Mongolia and provide support for the two business communities. He also spoke highly of the success of the 132 nd Inter-Parliamentary Union Assembly that took place in Hanoi last March which he said raised Vietnam's stature in the global scene. Son, who is visiting Mongolia from July 1-4, called for all-level visits and experience sharing within multilateral activities and international forums to be maintained. Both sides concurred that the two legislatures have nurtured bilateral ties over the past time and the cooperation agreements signed in December 2010 and March 2015 have created a legal framework for them to deepen two-way links. The deputy speaker accepted his guest's invitation to visit Vietnam. In another meeting with the Vietnamese guest, Speaker of the Mongolian parliament Z. Enkhbold expressed hope that Vietnam would back Mongolia's participation in the Asia-Pacific Economic Cooperation (APEC) forum, its development of ties with ASEAN member states, and bids for a seat in the United Nations Human Rights Council for the 2016-2018 tenure and to become a non-permanent member of the UN Security Council for the 2023-2024 term. During the visit, NA Vice Chairman Huynh Ngoc Son is to meet with Secretary General of the National Security Council Ts Enkhtuvshin and Minister of Defence Ts.Tsolmon. July 2 (Public Finance International) The poverty rate in Mongolia last year stood at 21.6%, down from 27.4% in 2012 and driven by the continued growth in livestock incomes, pensions and real wages, the World Bank has revealed. The bank and Mongolia's National Statistical Office examined household income, expenditure and living standards using an international standard poverty methodology. Their findings showed that, although the poverty rate fell by 5.8 percentage points between 2012 and 2014, the pace was slow compared to the 2010 and 2012 period when it dropped by more than 11 percentage points. James Anderson, the World Bank's representative to Mongolia, said: "One of the goals of the World Bank Group is to end extreme poverty and we are glad to see that Mongolia is making progress, reducing the poverty rate to 21.6%. "We are very encouraged that the pace of poverty reduction in Mongolia remains high by international standards. At the same time, the fact that one in five people lives in poverty serves as a reminder that many people are still vulnerable." Rural areas saw the fastest poverty decline, dropping by 9 percentage points and accounted for more than half the reduction in poverty rate between 2012 and 2014. This reduction in poverty was because of continued growth in livestock incomes in the Highland regions especially, which benefited from government funds under the livestock incentives schemes. It contributed to 44% of the poverty reduction in Mongolia. Poverty reduction was slower in urban areas, however, pensions, real wages and non-farm employment contributed to the poverty reduction between 2012 and 2014. The first vinyl record shop has opened in the Mongolian capital, Ulaanbaatar. Dund Gol Records opened in the Children's Book Palace of Mongolia in March, 2015, according to a report on The Vinyl Factory website. One of the world's most isolated record shops, Dund Gol Records is the brainchild of B. Batbold. It has a stock of over 1,000 vinyl records from Batbold's own collection. In an interview with The UB Post, Batbold said, "Western artists are releasing vinyl records instead of CDs. I don't want to keep all my vinyl records. I want to spread vinyl records to people who collect vinyl records. That's why I opened the store." When asked what his most expensive items were, he replied: "The average prize is 50,000 MNT [£16]. Unique records are a bit more expensive. Old and used records are cheap. "The most expensive record is by the Mongolian modern music band Soyol-Erdene and a record by Bayanmongol, which was recorded by a Russian company named 'Melody' in 1970. Vinyl record collectors around the world are interested in these two records because they are very rare." Dund Gol Records stocks a selection of western pop and classical music as well as local bands. You can find more information on their Facebook page. Another store in Ulaanbaatar – HiFi CD Shop – specialises in Mongolian music CDs.